Hillary Clinton is a liar. No big news there. Recently she was caught lying about her Bosnia trip and I’m ok with that too. Really, it’s Hillary, I expect her to lie. 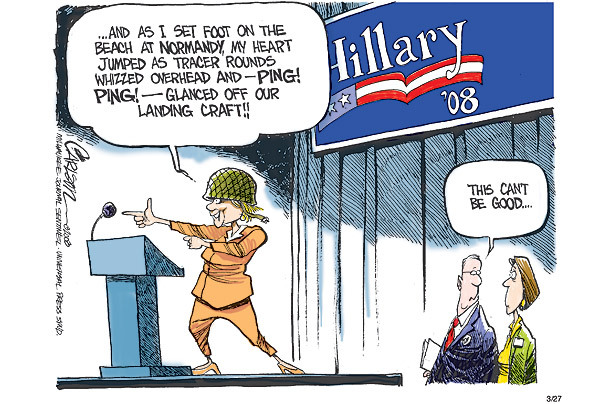 Remember when she said she was named after Sir Edmund Hillary? That’s just the kind of person Hillary is. And that’s ok.
What isn’t ok is her lying about her recent lies. Lying about lies, that’s just bad form. Hillary has done exactly that. Hillary stated that she “misspoke”, she was “sleep deprived” and that she “say(s) a lot of things, millions of words a day”. A good try, but these are just lies to cover up past lies. If she misspoke, misstated or was sleep deprived why did she make the same claim in December and February? Why were her lies part of her written speech? Why did she further lie by stating that she left the tarmac after greeting the little girl when there’s photographic evidence that she didn’t? Seeing as how the past 16 years have been Clinton and Bush I’m used to lies. Maybe I could have even let her lies about her lies slide. Maybe. Where do I draw the line you ask? Shoddy math, that’s where. I’m not asking our president to know anything about economics or the tax code or other important presidenty things. All I ask is for a little knowledge of basic algebra and that’s where Hillary really effed up. She stated that she says millions of words a day. Really Hillary? Millions? There are 86,400 seconds in a day. So what you’re now telling me is that you can fit multiple millions of words into less than 100,000 seconds? Do you think you’re Rebel XD or something? Either throw down with your mad rapping skills or admit you lied. Otherwise you’re no better than Bush. The bad Bush.